Testimonials say a lot about a company, and the products and service they provide. We list some of the feedback we have been getting from our customers here, so that you can decide for yourself if Quilt Display Products is a company you would like to do business with. 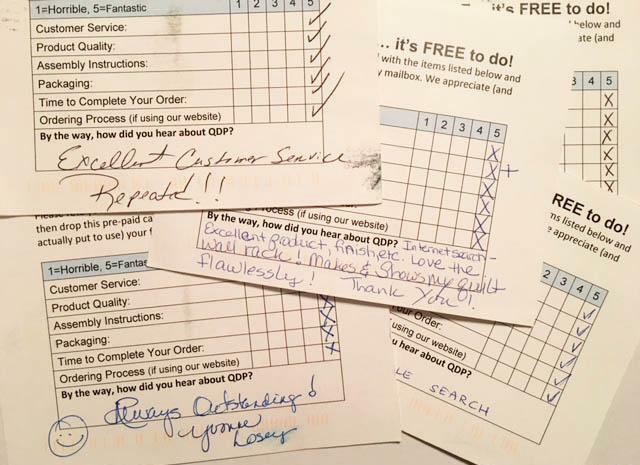 We send report cards with each order for our customers to make comments. We've have received nearly 100 back like the ones pictured on the left. Our average score from 1 to 5 with one being horible and 5 being fantastic is 4.94! That says a lot about our Customer Service, Product Quality, Assembly Instructions, Packaging, Time to Complete an Order, and the Ordering Process, all of which are reported back to us. If you feel strongly about our service or products (good or bad), feel free to provide your feedback using our Contact form or go to our facebook page and leave a review. "Steve went above and beyond with customer service - and I love my quilt wall hanger. I am so pleased!" "I love my mini quilt wall hangers! Thank you so much for a wonderful product. It was a pleasure meeting both of you at the Dayton Shop Hop. I know I will be ordering again in the near future." "I wanted to confirm that the second shadow box arrived and the Clear Maple will work beautifully. Again, I appreciate your responsive customer service in sending the second one at no charge, and allowing me to keep the Red Oak one as well. By all means, add my comments of satisfaction to your testimonial page. I'm also sharing information about your company to friends locally." "Steve, There was no Score Card in the box, but I will tell you that I love the Frame. The wood stand is beautiful. The time of delivery from order to receipt was better than promised. Correspondence regarding order and shipping was excellent, and the arrival, what can I say, after opening the box, I sat down and immediately planned what kind of a block would be perfect for the frame. The quality of your products is outstanding. Thank You. Kathy S."
"My mother bought me a 18 inch Quilt Ladder in Dark Red Oak. I wanted to contact you and let you know that the product is absolutely beautiful, the craftsmanship is wonderful. I was able to put it together in 5 minutes...it took me longer to unpackage it. Thank you so much for all you do." "I have received the Quilt hanger and I LOVE IT!!! Its so perfect. . I cannot wait to use it . . Thank you again so much." "We are absolutely delighted with the quilt ladder - the quality of the workmanship and the excellent packing for shipping were most impressive! I am taking a picture of my quilts on my new quilt rack and am sending it to all of my quilting friends. I am including your website and my strong recommendation for your products." "I just want to thank you for the beautiful quilt hanger. It works perfectly and was easy to install. I was especially impressed with your emails that kept me informed of the production status of the hanger. I am not a quilter but my fiber arts guild made a beautiful quilt for me and I am now able to hang it where I can admire it daily." "Just got my display rack I ordered in Chicago at the quilt show. I love it. It is a perfect match and the workmanship is beautiful. Thanks." "I wanted to let you know I received the quilt display stand Wednesday afternoon and put it together tonight--it is beautiful! The stand pieces were superbly wrapped and easy to put together. Cherry is my favorite wood and the beauty of the simple Shaker styling is timeless...I know I will enjoy the stand for years to come (as will my quilts!)." "This is my first order from your company. The customer service has been first rate all the way and the product is of very high quality. Thank you for the promotion order and if I cannot use it, I will pass it along. It is so wonderful to find a small company with a targeted product that provides such excellent customer service and quality. Thanks again." "Delivered in perfect condition. Love my quilt ladder."